Rubbing Strips Clean is the dedicated cleaning system for only unpainted plastic materials. Wax and dirt clogged on fiber surfaces of unpainted plastic parts are quite difficult to be removed by normal shampoo wash. Although they are incredibly hard to be removed, you should not use strong solvents to do so, the materials will be damage owing to the fact that they are unpainted. In this case, use Rubbing Strips Clean. This product has been specifically developed for cleaning of unpainted plastic parts. It will scrape out and remove wax and dirt clogged on fiber surfaces of unpainted plastic parts. An application is simple; put the liquid onto the sponge included then rub off surfaces. The detailed instruction manual with pictures is attached so that it is easy for anyone even for first time users. One bottle (50ml) can clean all the door strips of approximately 8 normal size cars. Newly developed pH neutral agent specifically optimized for molding with the dedicated ultra-fine fiber sponge. Rubbing Strips Clean is not only relying on its cleaning power, with the dedicated ultra-fine fiber sponge for the agent, those plastic pars are cleaned with the perfection. You will be surprised how effectively the product can clean and remove wax and dirt on plastic parts. 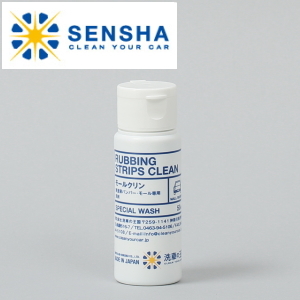 Rubbing Strips Clean has been developed with the knowledge and experiences of the industry’s leading car care shops in Japan. The product cannot be compared to other products because it is totally different. This product is only for unpainted materials such as strips and bumpers with rough surfaces. This product should not be used for materials with clear transparency such as door visors and headlight. For plastic parts with clear transparency (door visors, tail lights and headlights), please use Plastic Polish.